We’ve been around for more than 4 years so I think its safe to accurately throw around the word “History”. As you all know, whenever we go to Vegas, the intro of the show is related to that trip. 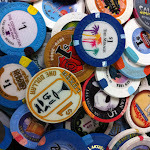 Random Vegas is related to what we did, the review is one of ours and Twitpic of the week becomes Twitpic of the Trip. For the first time in the shows history, the Twitpic of the trip, while it was taking while we were in Vegas, it wasn’t taken by one of us. This trips’s winner was taken by @agcorrington. It’s panorama of the strip looking across the fountains of Bellagio. This view is stunning and tends to frequently have a pic in the running every few weeks. However this is, hands down, the best at capturing what it actually looks like to be there enjoying the view. The only thing I can compare it to is when my smoking hot wife allows me to do some deep see exploration below the equator…I’m talking about going down on her incase that was too clever for any of you. The picture is fantastic and well worth making show history.